In writing about the post-digital condition, media commentator Florian Cramer identified a “semiotic shift to the indexical”(22) and away from symbols. The indexical relationship is a direct connection between an object and its sign, as if the sign is caused by its object (as smoke or soot are caused by fire). Forensic investigations in criminal cases inevitably appeal to the idea of the indexical sign: the bullet hole in the wall is a sign that someone fired a gun. So, a “shift to the indexical” implies that people now give priority to effects and causes, and “real” connections between the signs we use and the things we use them for, i.e. the objects in the world. Perhaps we now make fewer demands on the signs around us in the post-digital era. In everyday language, to say that B is caused by A draws on the idea of the index, though for the semiotician causality is just one manifestation of the indexical sign. Semiotic theorists think that the indexical sign is prior to causality. The index comes before any attribution of causes. Another important, and negative, feature of the indexical sign is that it does not (necessarily) provide an image (visual or via any other sense) of the thing to which it refers. A painting of a fire gives you a visual idea of fire, and as such serves as an icon (not an index). But the soot that we see on the chimney breast does not provide the look and feel of that of which it is a sign. In so far as soot is an index it doesn’t look or feel like fire. 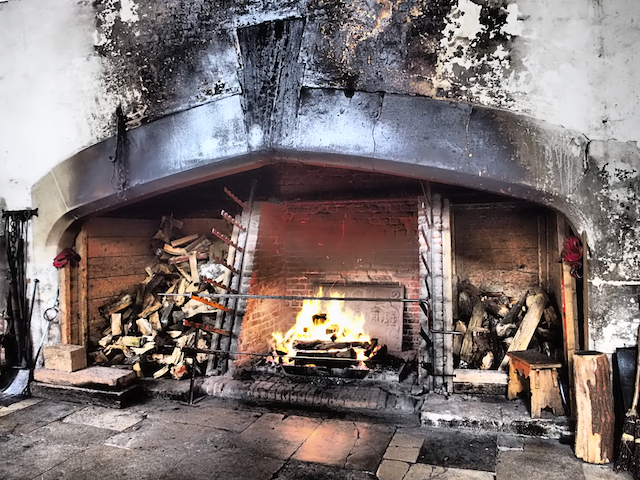 Here is a photograph I took of a sooty fireplace during a visit to Hampton Court in 2014. Peirce invented further categorisations of signs drawing on some esoteric terms in linguistics. A rheme is a qualifier that is on the way to adding new information to a statement (e.g. something is cosy). I think an adjective is a rheme. A dicent is a complete qualitative expression (e.g. the kitchen is cosy). Here are two further sign distinctions. A sinsign is an abstract, singular sign outside of a recognised language system, i.e. a grunt, sigh, gesture from a human or animal, or a mechanical or other sound (or sign) from nature, the crackle of a fire. A legisign is a sign delivered in some conventional language, i.e. legible words and phrases spoken or written (“the kitchen is warm”); or a red traffic light is understood via a language of road sign conventions to indicate stop. 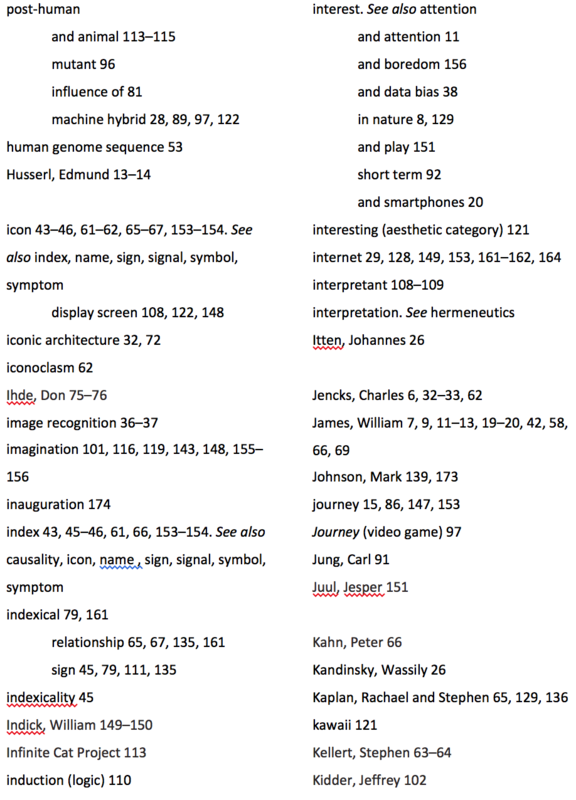 Peirce combines such terms to produce 10 categories of signs, though I’ll only refer to the index subcategories here. I don’t think that these fine distinctions have been taken up in architectural discourse. In pragmatic vein we can ask what is the use value of such distinctions in architecture? It seems to me that any sign could move from one category to another depending on how you describe the sign situation, i.e. how you interpret it. According to Peircean theory, the photograph above (not the fireplace itself) is also a dicent-indexical-sinsign. Unlike a painting (an icon), a photograph is caused by the process of the camera. But a photograph is nothing like a weathervane (above) in other respects. So a theory of signs that insists on categories but confuses rather than clarifies I think has diminished use value in creative disciplines … not that everyone agrees with that. But indexes are undeniably useful. In terms of semiotic vocabulary, what is an ordinary indexical entry in a book or a computer database? As explained in a previous post, a hash (or a digital signature) is an index pointing at a bit of data. The hash is derived via an algorithm. So, (I think) an entry in a hash table is a rhematic-indexical-legisign. It is derived algorithmically and cryptographically from the content of the thing being referred to. An algorithm is also in play in the case of a book index. There’s a method, and as far as I am aware it can only be partially automated. The indexer (me) identifies key words, the pages on which they appear, lists the key words, and then places the page numbers next to the relevant words in the list. I’ve just finished labouring through the algorithm for my tenth book index. Here is some of it.